Under the Köppen climate classification, Panama City has a tropical wet and dry climate. Panama City sees 1900 mm of precipitation annually. The wet season spans from May through December, and the dry season spans from January through April. Temperatures remain constant throughout the year, averaging around 27.3 °C (81.1 °F). Panama's old quarter features many architectural styles, from Spanish colonial buildings to French and Antillean townhouses built during the construction of the Panama Canal. The more modern areas of the city have many high-rise buildings, which together form a very dense skyline. There are currently more than 110 high-rise projects being constructed, with 127 high-rise buildings already built. The city holds the 40th place in the world by high-rise buildings count. The skyline of Panama City from Ancon Hill. 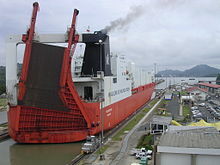 RORO carriers, such as this one at Miraflores locks, are among the largest ships to use the Panama Canal. Being the economic and financial center of the country, Panama City's economy is service-based, heavily weighted toward banking, commerce, and tourism. The economy depends significantly on trade and shipping activities associated with the Panama Canal and port facilities located in Balboa. The city has benefited from significant economic growth in recent years, mainly due to the ongoing expansion of the Panama Canal, an increase in real estate investment, and a relatively stable banking sector. There are around eighty banks in the city, at least fifteen of which are national. According to Professor Rodrigo Miró, the first story about Panama was written by Gonzalo Fernández de Oviedo y Valdés and published as part of the Historia General y Natural de Las Indias in 1535. Some poets and novelists born in Panamá city are Manuel María Ayala (1785–1824), Amelia Denis de Icaza (1836–1911), Darío Herrera (1870–1914), Ricardo Miró (1883–1940), Gaspar Octavio Hernández (1893–1918), Demetrio Korsi (1899–1957), Ricardo Bermúdez (1914–2000), Joaquín Beleño (1922–88), Ernesto Endara (1932–), Diana Morán (1932–87), José Córdova (1937–), Pedro Rivera (1939–), Moravia Ochoa López (1941–), Roberto Fernández Iglesias (1941–), Jarl Ricardo Babot (1946–), Giovanna Benedetti (1949–), Manuel Orestes Nieto (1951–), Moisés Pascual (1955–), Héctor Miguel Collado (1960–), David Robinson Orobio (1960–), Katia Chiari (1969–), Carlos Oriel Wynter Melo (1971–), José Luis Rodríguez Pittí (1971–), and Sofía Santim (1982–). The belltower of the San Francisco Church. ^ "World Weather Information Service - Panama City". World Meteorological Organization. Dicapai 2012-08-04. ^ "In Panama City's Old Quarter, a Rebirth Takes Place". Boston Globe. 2007-01-22. Dicapai 2011-02-11. ^ "Skyscraper page Panama City". Skyscraperpage.com. Dicapai 2010-06-26. ^ "Skyscraper page Cities List". Skyscraperpage.com. Dicapai 2010-06-26. ^ "La Prensa Newspaper". Mensual.prensa.com. Dicapai 2010-06-26. ^ "Panama Useful Facts". Dicapai 2011-02-17. 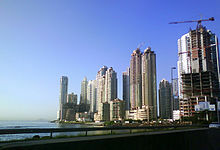 ^ "Panama economy grew 2.4 percent in 2009". Reuters. 2010-03-02. Dicapai 2011-02-17. Laman ini diubah buat kali terakhir pada 19:07, 2 September 2016.